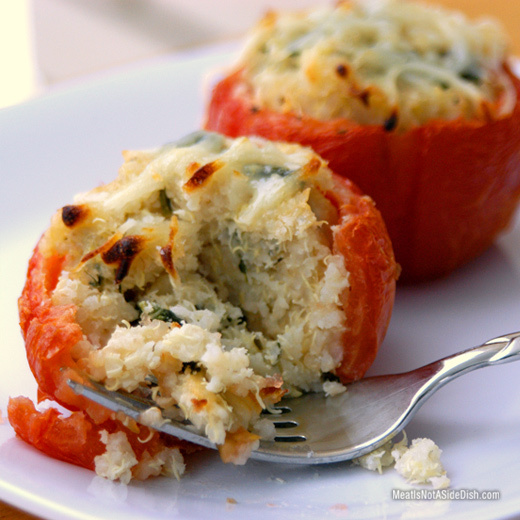 To make this Quinoa Stuffed Tomatoes recipe, in large saucepan, heat butter and add minced garlic. Cook until tender. Cut spinach into 1/4 inch strips. Add spinach, pepper and lemon juice to saucepan and cook until spinach is wilted. Remove from heat. Add Parmesan cheese and 4 oz of mozzarella cheese to quinoa and mix until combined. Add spinach mixture to quinoa until uniform. Cut the tops of the tomatoes off and discard. Using a spoon, scoop out the seeds and liquid from the inside of the tomatoes and discard. 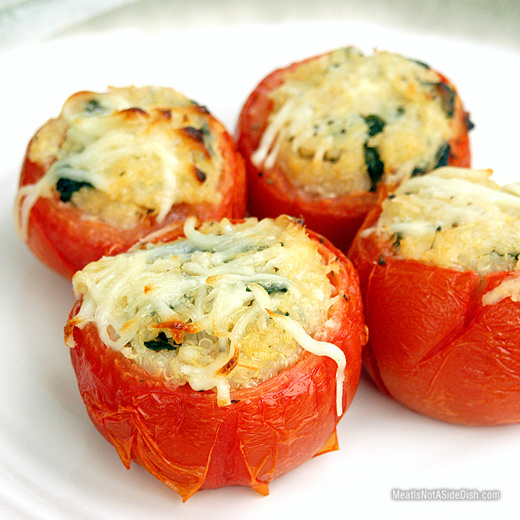 Stuff each tomato full with quinoa mixture and top with remaining mozzarella cheese. Place on greased cookie sheet with greased baking rack. Cover loosely with aluminum foil to avoid over browning. Cook 20-30 minutes. Tomatoes should be soft and peeling but still juicy.